This past Saturday Alex and I were having dinner with some new friends and, as these situations are wont to do, found ourselves on the topic of head traumas. Whenever this topic arises in conversation I always have a particularly pertinent (and traumatic!) story to share. It happened many years ago, when Alex and I were Juniors in college and he had an especially bad case of light-headedness after standing up quickly. You know how that can happen where you see spots and perhaps get a little light-headed when you stand up quickly after sitting for a period of time? Recently, I’ve noticed this occasionally happening to me in yoga when moving fast from the floor to standing (though, it happens far less the more yoga I do). But this has always happened quite severely for Alex to the point that he can temporarily lose his sight and the world becomes black. So his head trauma went down like this. It was a hot summery day and after sitting at the computer for some time, he quickly jumped up and headed to the kitchen to prepare some lunch. At the time, I was in the bedroom and shortly after heard a loud thump from the kitchen—it sounded like something had fallen from the top of the refrigerator. “Did the waffle iron just commit small-appliance suicide?” I thought to myself. A brief second later, I heard Alex meekly call my name and I walked over to the kitchen to find him laying flat on the floor. Oh! That wasn’t the waffle iron, but a person! Before I could ask the question of how he ended up on the floor, he asked me what happened. In my own confusion, my best answer was “I think you fell on the floor and hit your head.” “Oh, ok,” he said. Then about five seconds later he asked the exact same question to which I replied the exact same way. After the third time of him asking the exact same question with no recollection that he had already asked me the same question three times, my panic meter started to rise. He sensed my panic and started to reassure me not to worry and that he was beginning to feel better. Whew! I calmed down a bit, but it was only a brief minute as the same words “What happened?” began to spew out of his mouth. At this point I called the ER and we headed to the hospital me fearing the worst—that he had endured a serious brain injury and may never be the same person again. If you’ve ever seen Memento, which I happened to watch in the theaters a week later (thank god it was not before!) this whole incident, Alex behaved exactly like the star of that film—his short-term memory was completely kaputt. On the way to the hospital, I tested his long-term memory quizzing him as to who his parents and sister were, what his middle name was, where he grew up and, interestingly, all of that checked out fine. However, anything that happened within the past few minutes was wiped entirely from his memory shortly after it happened. Actually, I also recall asking him about the class he attended that morning and he had so much confusion about it responding with, “I’m taking a class?” So I guess his memory loss included other more immediate memories too. After spending 8 hours at the hospital and having countless head (and other body) tests performed, we slowly noticed Alex start to regain some of his short-term memory and by the end of the day he was pretty much back to normal. All of the tests checked out fine and it was concluded that his short-term memory loss was due to hitting his head (big surprise there). Needless to say, the entire event was extremely traumatic for me and, while the ordeal only lasted a day it has impacted me years later to this very day. I no longer shrug off loud noises that happen in another room and sometimes find myself immediately jumping to the worst possible conclusion as to what produced the noise. Thankfully, this crazy reaction has lessened over the years as the distance from the event has grown. Anyways, I tell this story not just because it came up at dinner on Saturday, but also because it reminds me of today’s post and highlight, TVP. After Alex’s post-head-trauma drama, our unmedically substantiated diagnosis was that he needed to get more protein, which we later learned from the cardiologist was completely wrong as it turns out that salt and water are the antidote to combat that light-headed feeling. But back to the protein solution. 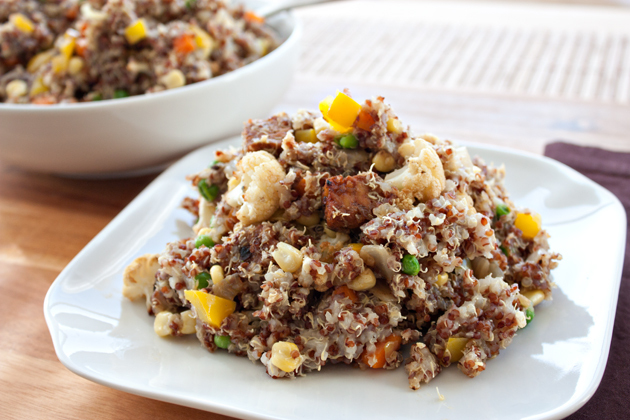 After doing some research and seeing TVP, textured vegetable protein, at our local co-op we concluded that it was the fastest and least expensive (we were college poor) way to consume high quantities of protein (Alex wasn’t even vegetarian at the time so it’s fascinating that he figured that out.) 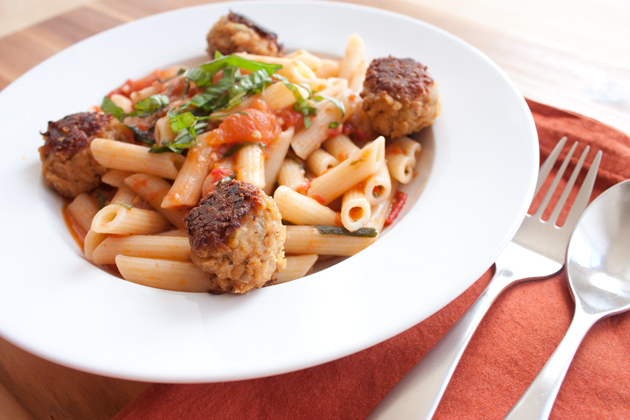 I remember him eating dried TVP in his yogurt like you’d put granola in your yogurt to pack in the protein and it wasn’t until a couple years later that we figured out how to make tasty food creations with it, like baco-bits and these super-delicious, could-pass-as-animal-flesh meatballs. 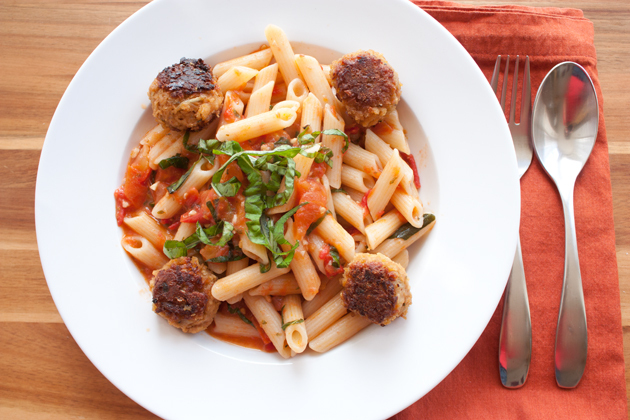 Not only are the meatballs in this dish amazing, but the abundance of fresh tomatoes seen in the markets right now are a perfect way to enjoy those fruits of summer as well. And here’s how to do it. Measure and pour the two cups of TVP into a heat-proof dish and then pour 1 3/4 cups boiling water over it. Stir it well so that all of the TVP is moistened. Let it sit. Then saute your onion in olive oil for 10 minutes and add it to the TVP. Mix well. Add your spices, soy sauce, and flour. Again, stir to combine so that everything is well incorporated. Form your balls. I measure mine in a small cookie scoop so that all of them are of equal size and firmly squeeze and roll them in my hands so that they don’t fall apart when you handle them. This recipe made around 28 balls for me, but the number you make will, obviously, depend on the size of your balls. If you like larger balls, you’re not going to have as many of them. Then you want to fry them in oil for several minutes on each side. Make sure you slide a spatula underneath each of them (or a fork, if you’re into that). That sad, broken ball in the middle was a result of not rolling it around enough, so it ended up sticking to the pan. Make sure you give them lots of attention, because nobody likes sticky balls. My second batch was much better with zero casualties after making sure none of them were sticking while cooking. While my meatballs were cooking (thus the divided attention and sad meatball incident) I started to prepare my sauce. I first chopped my basil in chiffonade style where you stack several leaves on top of each other, roll them and then slice. 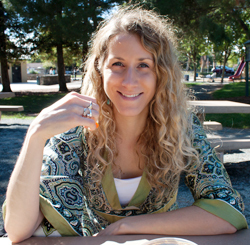 You end up with these pretty curls that you see in the below photo. After chopping my basil, I diced my tomatoes and minced my garlic. I poured the 1/4 cup of olive oil into a large saute pan and heated it over medium heat. When it was hot, I added the garlic and cooked it for about 3-5 minutes—just until it started to brown a little. Then I added the tomatoes and cooked them until they were heated through. Oh, I forgot to mention that while I was doing all of that, I put a pot of water on to boil and cooked penne pasta so that finished cooking just as my sauce was done. I poured the strained pasta on top of the tomato sauce and mixed them all together. I then added my spices; fresh basil and dried oregano and mixed it all together. 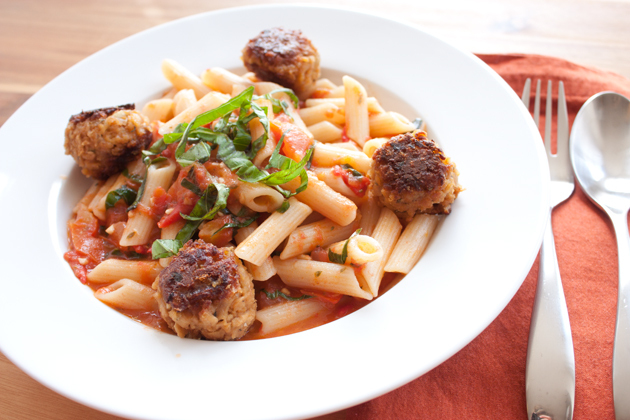 I served it on large soup dish with 4 meatballs and topped it with fresh basil chiffonade. Make Meatballs: Pour boiling water over TVP and let it soak for 10 minutes. Saute the onion in the olive oil for 10 minutes (until soft and translucent), and then add it to the TVP along with the chili powder, garlic powder, pepper, salt, oregano, soy sauce, and flour. Stir until well-mixed. Mold this mixture into balls and be sure to press them together firmly so that they don’t fall apart when handling or frying. Fry in oil until crispy (several minutes on each side.) And don’t forget to run a fork or spatula underneath them while they’re cooking to prevent them from sticking to the pan. Cook Pasta: Put a large saucepan filled with water on high heat and add the entire package of dried pasta when it begins to boil. Cook for 10 minutes or until al dente, then drain the water. Tomato Sauce: In a very large saute pan, heat the 1/4 cup of olive oil over medium-high heat and when it’s hot add the minced garlic. Cook for 3-5 minutes or until it just begins to brown. Be careful not to burn the garlic. Add the tomatoes and cook for another 3-5 minutes until they’re heated through. 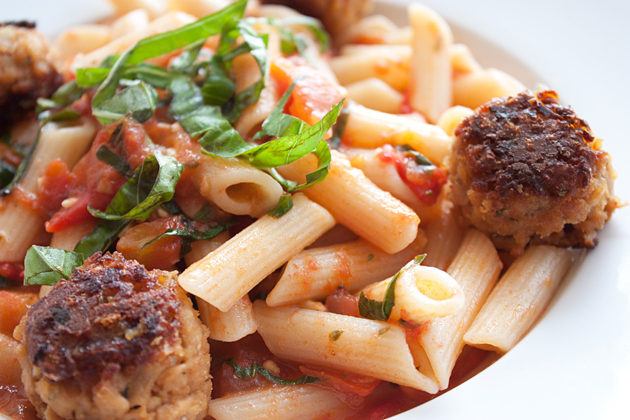 Put it Together: Add the cooked pasta to the tomato sauce and mix well. Add 1 cup of the basil and the teaspoon of oregano. Stir to combine. Lastly, add salt and pepper to taste. 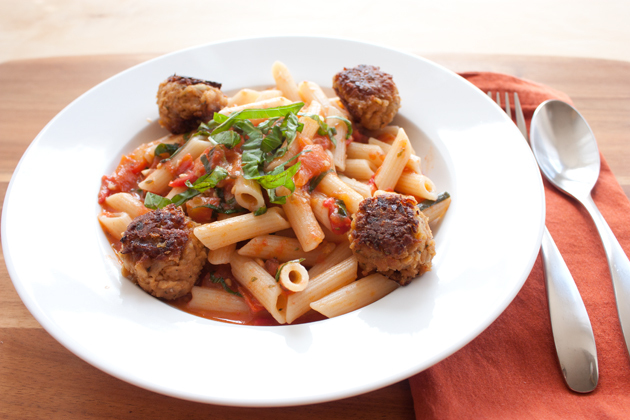 Serve in a large bowl or plate with the meatballs and fresh basil on top and get ready to pop them in your mouth! I love this time of the year! I particularly love how farmer’s markets are brimming with such a variety of produce. And even though we Californians are lucky to see fresh produce (like strawberries) year-round, there is still seasonality to a lot of what shows up in the markets. Two specifically summer veggies that caught my eye this week were fresh corn on the cob and bright yellow summer squash. I decided to pair them together along with bright green watercress and flavorful thyme to create this light, summery, side dish. It turned out awesomely and I’m thinking it would be a great dish to bring to a 4th of July potluck this Wednesday. Hmmm… now I just need a potluck to be invited to. To start, place a large saucepan full of water over high heat, cover, and bring to a boil. Meanwhile, shuck your corn and gently place each ear in the boiling water being careful not to burn yourself. Turn the heat down to a simmer and cook the corn for 10 minutes, partially covered. While the corn is cooking, chop your summer squash and heat the olive oil in a medium saute pan over medium high heat. When the oil is hot add the squash and saute for 5-7 minutes. While the corn is cooking and squash is sauteeing, de-stem and rinse your watercress in cold water and roughly chop it. When the corn is finished cooking, cut the kernels from the cob. 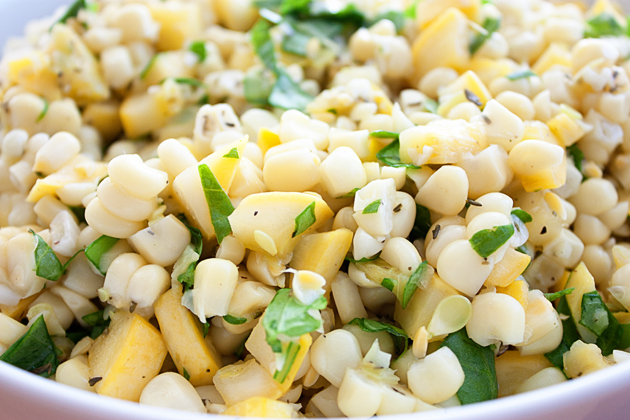 Add the sauteed squash, chopped watercress and stir well to combine. Measure your dried thyme, place it in the palm of your hand and crush it between your fingers or hands before adding it in the bowl. Add salt and combine everything again. 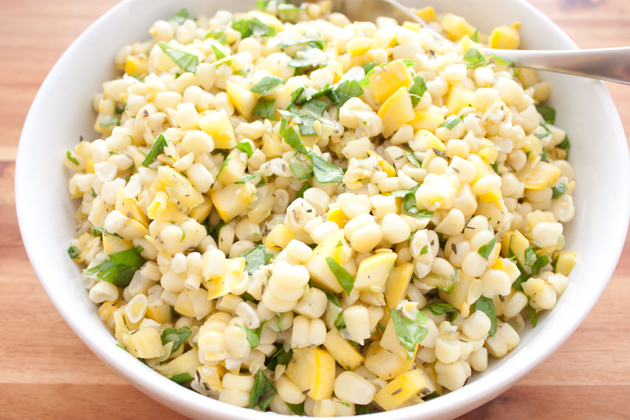 And that’s all there is to this easy, delicious summer side-dish! I really love how all of the flavors go so well together. 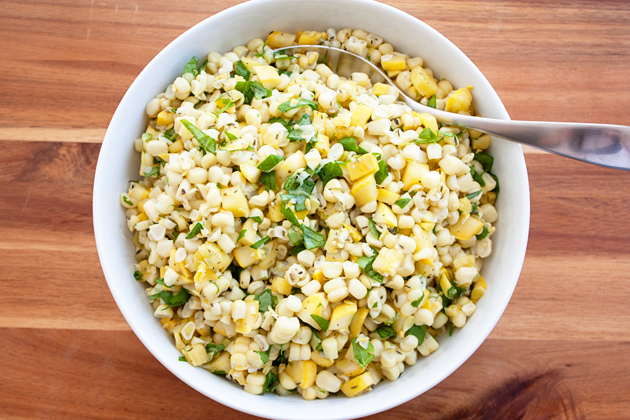 I especially love how the slight pepperyness of the watercress plays off of the super sweetness of the corn. Corn: Fill a large stockpot with water and place it on high heat; cover with a lid and bring to boil. Meanwhile, shuck all 4 ears of corn and gently place them in the boiling water. Squash: Chop your summer squash into small dice. Add the extra virgin olive oil to a medium saute pan and heat it over medium high heat. When the oil is hot, add the summer squash and saute for 5-7 minutes. Watercress: De-stem and wash your watercress in cold water and then roughly chop it. 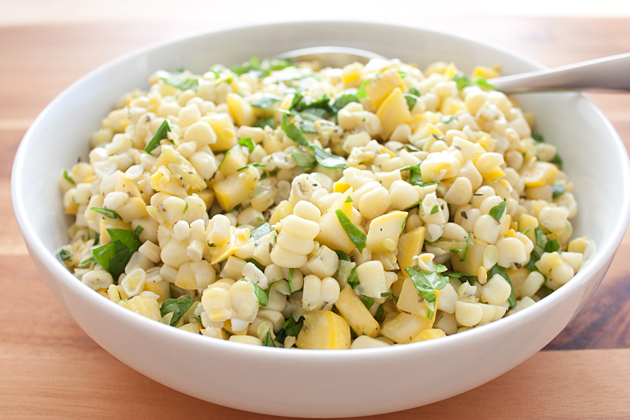 Put it all together: In a large bowl slice off the kernels of corn from the cob (as demonstrated in the third photo from the top), add the summer squash, and watercress. Stir well until all is combined. Measure the dried thyme and then rub it between the palms of your hands so that it the flavors are brought out as it falls into the dish. Add salt and then stir until everything is combined. Yes, I admit that I ate a lot of crap in high school. While I certainly enjoyed a variety of snack cakes like Ding Dongs, Swiss Rolls, and Devil Squares, one of my all-time favorite crap-snacks were Little Debbie’s Oatmeal Creme Pies. My girlfriend, Beth, and I would eat those things by the box and, if memory serves me correct, we’d routinely down an entire box before our basketball games. Clearly not the best food choice for sustained energy, but I claim ignorance for my poor choices of yore. 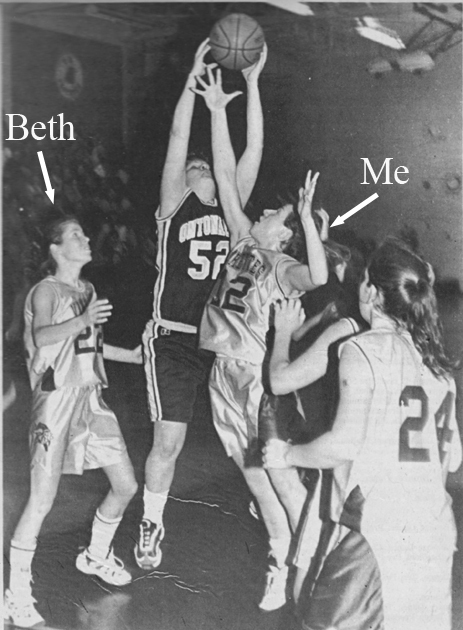 Thinking back to those b-ball days made me a little nostalgic and I couldn’t resist looking through old photo albums. This one was taken during our senior year in a game against our biggest rival, Ontonagon. It was during the district tournament and we ended up barely losing 43-41 so it also happened to be the final game of our high school career. 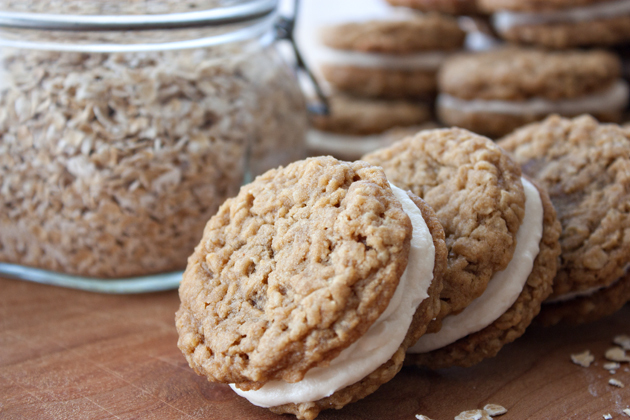 So now I present you with a healthier recipe for oatmeal creme pies made of whole ingredients, yet taste “like they have a pound of butter in them” (exact words from the mouth of one of my co-workers) and will surely give Little Debbie a run for her money. You first want to whisk together the flour, cinnamon, baking soda and powder in a medium bowl. Then cream the Earth Balance, sugar, and molasses in your stand mixer. 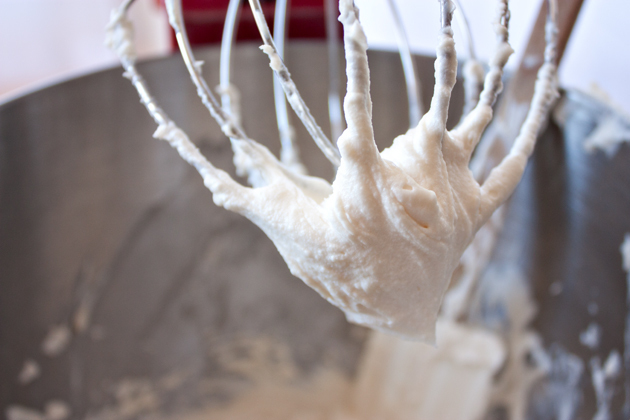 Keep beating until the mixture is light and fluffy like the photo below. Then add vanilla and beat again. 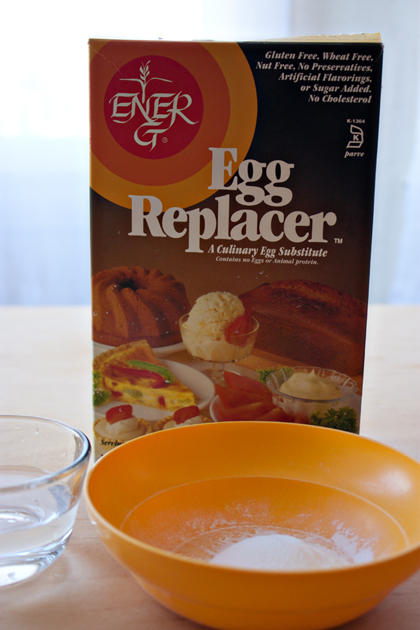 Put your Ener-G Egg Replacer in a bowl, add the water and beat with hand beaters until stiff peaks form. Add this mixture to the bowl and beat again. Slowly add the flour mixture to the bowl while the machine is beating on low speed. After you’ve added all of the flour, you may need to turn up the speed of your mixer in order to allow the dough to fully combine like the photo below on the right. Remove the bowl from the mixer, add in the oats, and stir by hand. Grab your cookie scoop and drop cookie dough balls on a parchment paper-lined baking sheet and space them 2 inches apart. Bake for 11 minutes at 350 degrees. They will flatten during baking, but still remain a bit puffy when done so you will need to press them flatter immediately after pulling them out of the oven. Transfer them to a cooling rack until completely cool and then turn them over. While the cookies are cooling, wash the bowl of your stand mixer and make your cream filling by putting all ingredients together in a bowl and mixing until creamy smooth. I made sure I had 24 bottoms turned over on the cooling rack and then spread the cream on top of each one. I laid them all out like this and didn’t put their top on until I had spread each cookie with cream. That way if I had lots of left-over cream I could add more to each cookie or, similarly, if I was running short on cream I could steal some from the already creamed cookies. When you’ve finished adding the cream, place the remaining 24 cookies on top. Prep: Preheat oven to 350 degrees and make sure that your Earth Balance and cream cheese are softened to room temperature. Also, line a baking sheet with parchment paper. Cookie Dough: In a medium bowl whisk together flour, salt, baking powder, baking soda, and cinnamon. In the bowl of your electric stand mixer beat the Earth Balance, white and brown sugars, and molasses on high until creamy and fluffy. You will need to periodically scrape down the sides of the bowl. Add the vanilla and beat again, until combined. Add the egg replacer and beat until creamy. Slowly add the flour mixture to the bowl while it’s beating on low speed. Increase the speed after adding all of the flour until well incorporated. Remove the bowl from the mixer, add in the oats, and stir by hand. Bake: Using a cookie scoop, drop the cookie dough 2 inches apart on a parchment paper-lined baking sheet. Bake for 11 minutes and don’t be alarmed if they seem too soft because these are supposed to be very soft cookies (and they will thicken slightly as they cool.) Press the cookies flat with your hands or another flat surface and then transfer them to a cooling rack until they’re completely cool. Cream Filling: In the bowl of your stand mixer, beat the cream cheese, Earth Balance, powdered sugar, and vanilla until smooth and creamy (about 3 minutes). Again, you’ll need to scrape down the sides of the bowl periodically so that everything is incorporated. Completed Cookie: Spread the filling on the flat side of half the cookies. Place the remaining cookies on top to make a sandwich. Amaranth? What the heck is that? My quick answer to that question is that amaranth is to the Aztecs as quinoa is to the Incans. 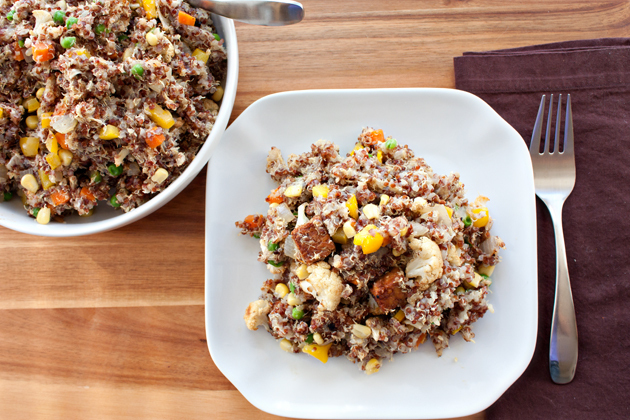 For many years it was the staple grain in the Aztec diet and, like quinoa did for the Incans, powered their civilization. 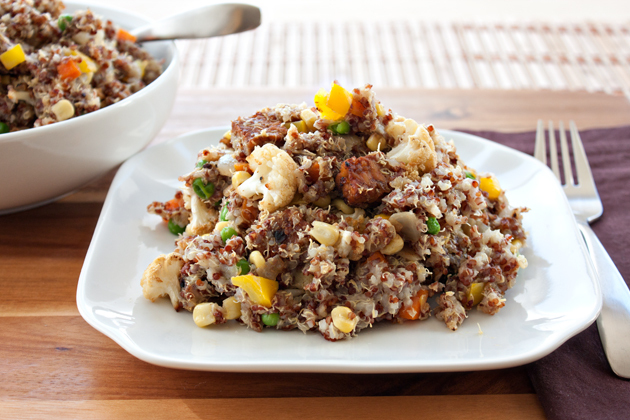 I remember when i first started cooking quinoa over ten years ago and, seeing as I had never eaten it before, or even heard of it, I had no idea what to expect in terms of flavor. At the time I remember that it wasn’t a runaway hit with me. It wasn’t that it was unsavory… I just didn’t LOVE it immediately. I didn’t LOVE it the way I do now. I suppose this is often the case with new flavors where they can take some getting accustomed to; an adjustment period. I may feel the same about amaranth. It too has a strong, distinct flavor when eaten alone so pairing it with the intense flavor of roasted sweet potatoes and bananas was a great first introduction for me (I’ve only eaten it in cornbread before). In fact, I loved this dish so much that poor Alex didn’t even get a chance to try it. Oops! 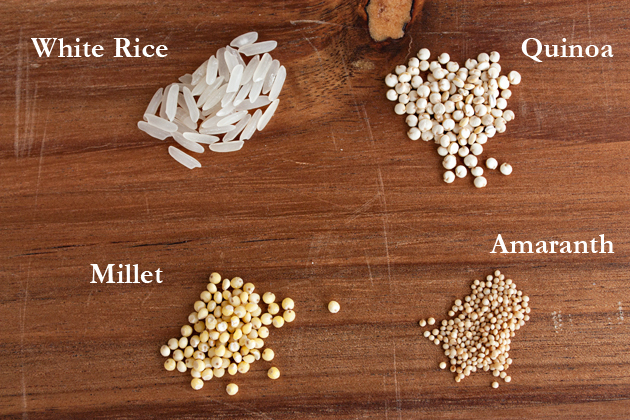 You can see how tiny amaranth is compared to other grains and, even when fully cooked, the tiny little pearls are still quite small. 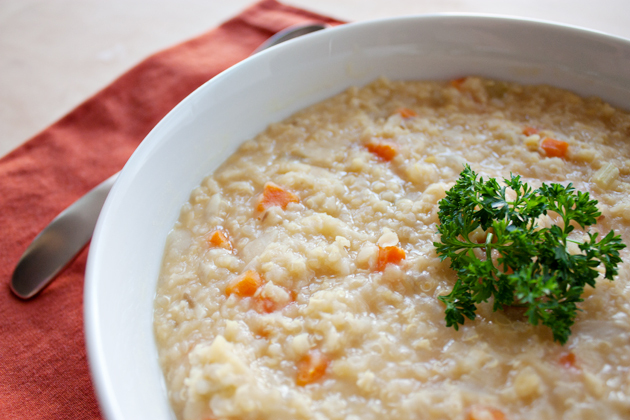 In the bottom right of the photo below you can see the little amaranth pearls mixed in with the roasted potato puree. The amaranth beads in this dish vaguely remind me of the pearls in tapioca pudding. They have a similar texture but, as someone who doesn’t like tapioca pudding that much, they are a lot tastier (and much smaller). Sorry to blather on about nutrition again, but I just can’t help myself as I’ve spent years studying how our bodies respond to food—our fuel. I find it so fascinating how food can be medicine when you eat certain things and stop eating others. But enough about that; here’s how to make this glorious, tastes-like-pumpkin-pie dish! After peeling and chopping your sweet potato, put it in a bowl and drizzle extra virgin olive oil over it, add salt, and toss to coat each piece evenly. 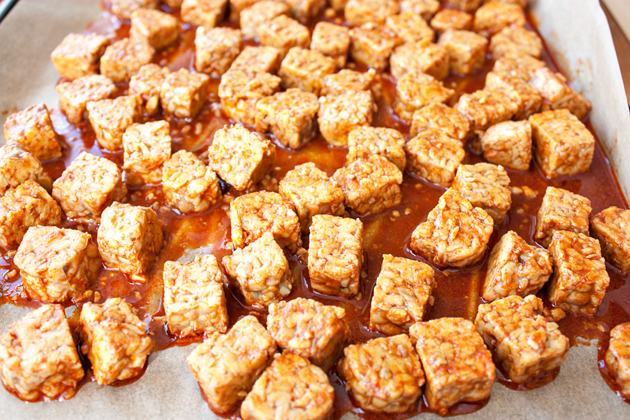 Place the chunks on a parchment-paper-lined baking sheet and place in a 400 degree preheated oven for 15 minutes. Then take them out, toss them with a spoon, and put them in for another 15 minutes. Do this once more (45 minutes in total) until they’re cooked through and look like the photos below. While you’re roasting your sweet potato, you can also roast your banana. However, instead of taking 45 minutes, the bananas only take 30 minutes to fully roast. Take them out at the 15 minute mark and turn each slice over. The photo above on the right is what they looked like right when I took them out of the oven after 15 minutes of roasting. Here, on the left, shows the bananas after I flipped them over, before putting them back in the oven, and the right shows them after the full 30 minutes. 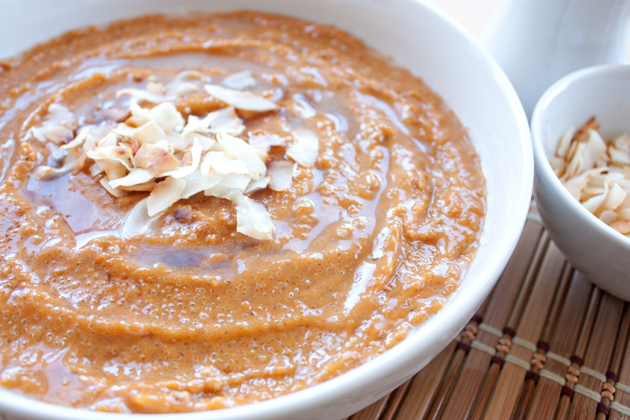 Now place your roasted sweet potatoes and banana in a food processor, add the spices, and start to puree. Add non-dairy milk to the mixture until the consistency is thick and creamy like the photo on the right. Also, I have to note that at this point I sampled a lot. This puree tasted like I was eating pumpkin pie filling. It was so flippin’ good! So don’t feel guilty if you can’t keep your spoon out of it either—it’s been known to happen. While your potatoes and bananas are roasting in the oven, measure your amaranth and place it in a large saucepan with the water. Cover it with a lid and bring to a boil. Then turn down the heat so that it maintains a low boil for 20-25 minutes or until all water has been absorbed. Towards the end of cooking stir it a few times to prevent sticking or burning on the bottom of the pan. 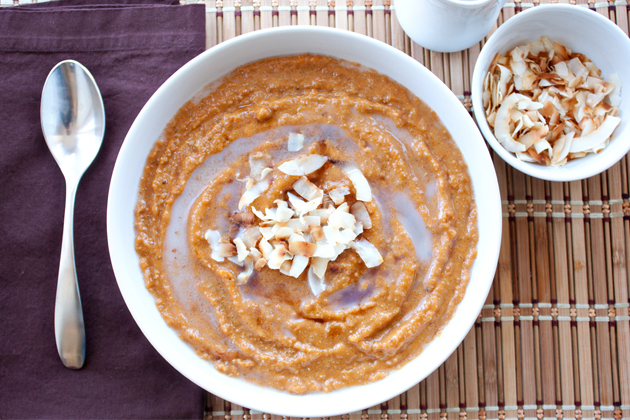 Add the sweet potato banana puree to the amaranth and mix it until well incorporated. Serve in a bowl and feel free to add toasted coconut, maple syrup (it’s actually so sweet that you might find this completely unnecessary), or non-dairy milk if you like. Roast: Preheat your oven to 400 degrees Fahrenheit. 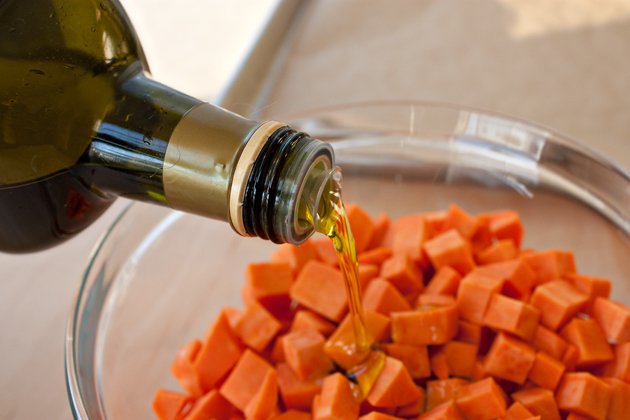 Place your sweet potato chunks in a bowl and add olive oil and salt. Toss until evenly coated. 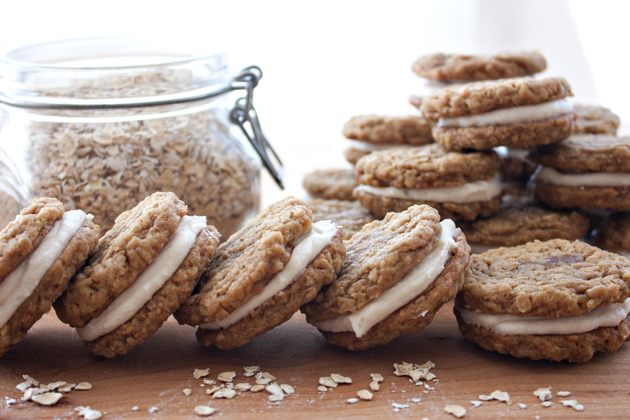 Spread them on a baking sheet lined with parchment paper. Slice your banana into small pieces and place them in a single layer on another parchment-paper-lined baking sheet. Place both sheets in the oven. Roast for 15 minutes, turn them over, and place in the oven for another 15 minutes. At this point the bananas will be done, but the sweet potatoes need to go back in the oven for another final 15 minutes of cooking. In the end the bananas will have roasted for 30 minutes while the potatoes will have cooked for 45. Cook Amaranth: While the potatoes and bananas are roasting, measure the amaranth and place it in a large saucepan with the 3 cups of water. Cover with a lid and bring it to a boil over high heat. 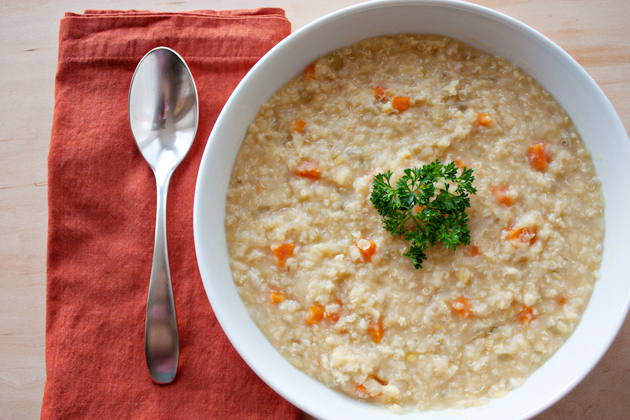 Once it has come to a boil, turn down the heat so that it maintains a constant simmer for 20-25 minutes or until all water has been absorbed. I suggest checking on it after 20 minutes and stirring it to make sure that the amaranth does not burn or stick to the bottom of the pan. 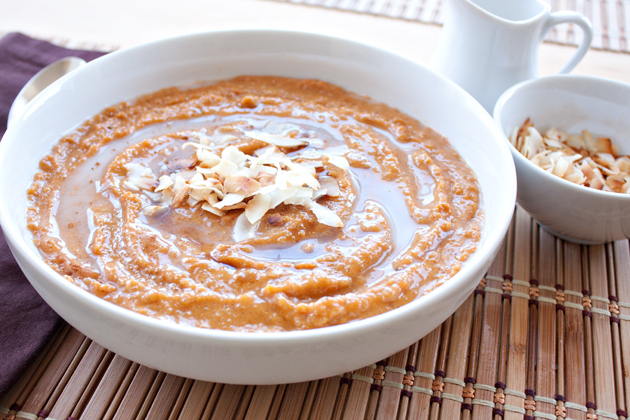 Puree: When the sweet potatoes and bananas are done roasting, place them in a food processor (I was able to do this in my mini food processor), add all of the spices, and puree. Add your non-dairy beverage of choice a little bit at a time until you reach the consistency of a thick pudding. Combine: Add the potato/banana pudding to the amaranth and mix until they’re thoroughly combined. Feel free to add any of the optional toppings you desire. As a vegan, I am often asked for examples of staples in my diet. In an effort to eat healthier, they want to know what kind of dishes are regularly prepared in my household. So today I figured I’d share a one-pot wonder that is frequently in our rotation. In fact, it’s so frequent that it often makes a once-a-week appearance at dinner and then shows up as leftovers in my lunch the next day. 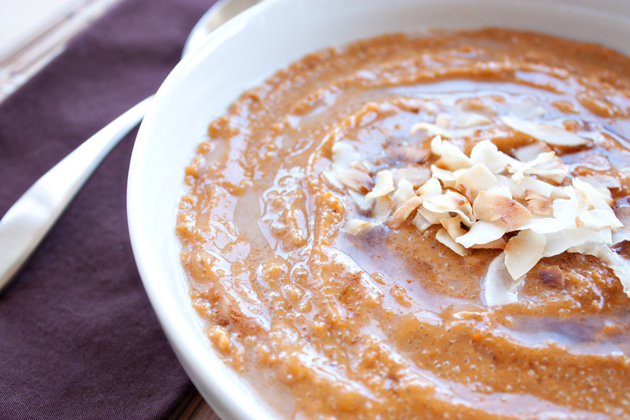 This Red Lentil Stew has so much going for it. Aside from it being incredibly tasty (even kids love this one! ), it’s also a nutrient powerhouse. 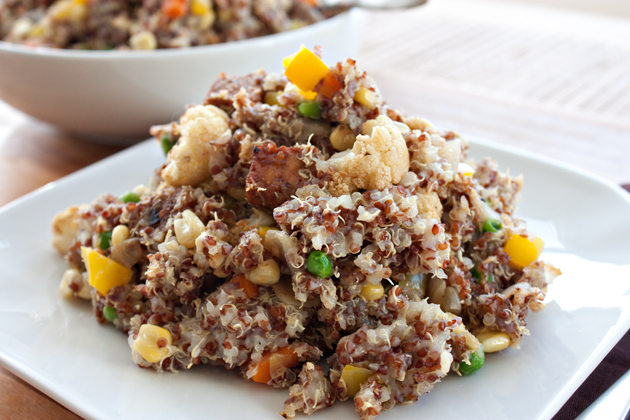 The lentils and millet pack a ton of protein in this dish, and together they actually make a complete protein, offering all of the essential amino acids humans need. There are some other interesting dances going on between foods in this dish. Let me explain. Iron is more easily absorbed by your body when consumed with vitamin C. Lentils are loaded with iron, while lemons and onion are loaded with vitamin C. So not only do they taste incredibly good together, but by joining forces, they make your body perform better. 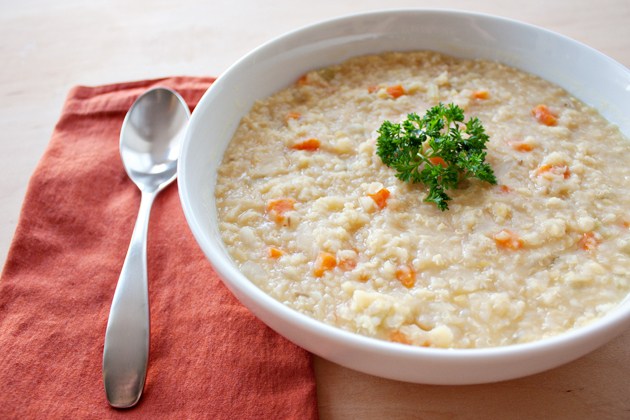 It’s like we evolved to want to eat lentil and millet stew. 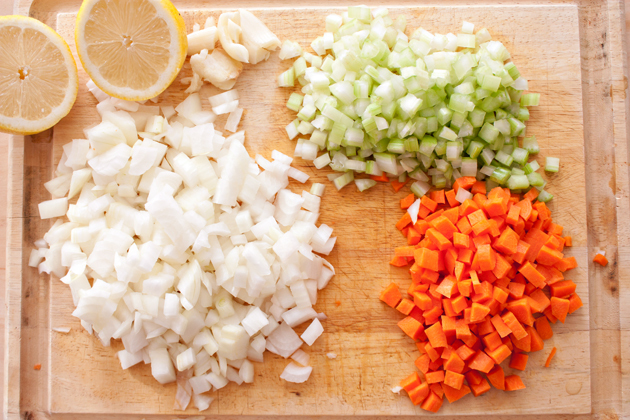 You first need to chop all of your veggies and then saute them in olive oil over medium-high heat until softened. Meanwhile, rinse your lentils and millet in a fine sieve under cold water. Pour the lentils into the veggie pot, add your water, and bring to a boil. 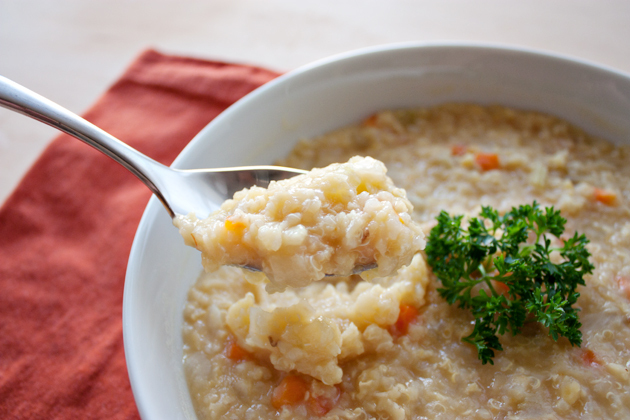 Simmer the mixture on medium-low heat for 20-25 minutes and then add the fresh squeezed lemon juice and salt. It’s as easy as that! Saute: Heat the olive oil over medium high heat in a large (~6 quart) saucepan. When the oil is heated, add the onion and celery. Cook for 10 minutes until softened. Add the carrots and garlic, and cook for another 7 minutes. 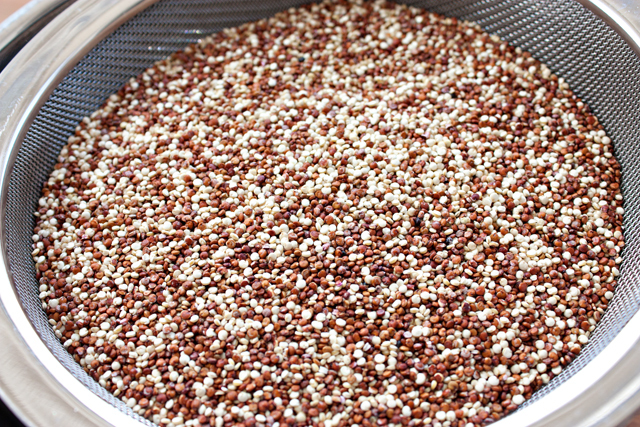 Measure and Rinse: While the veggie are cooking, measure the millet and lentils then rinse them under cold water in a fine sieve. After the veggies are done, add the lentils and millet to the pot along with the 7 cups of water. Cover with a lid and bring to a boil, stirring once or twice. Once it’s reached a boil, stir again, turn down the heat so that it maintains a simmer, and cover slightly with a lid. Let it simmer for 20-25 minutes and stir a couple times during cooking. Finishing Touches: After it’s finished cooking, add the lemon juice and salt. In my experience, I’ve added at least 1 1/2 teaspoons of salt, if not more. The salt really helps to bring out the lemon flavor and marry the other flavors in the dish very well. Note: This makes a very thick stew and if you want it more soup-like add another cup (or more) of water at the end until it reaches the consistency you desire. I have an interesting relationship with my microwave. Perhaps you’d call it an unwanted dependence? For example, every morning I use it to quickly cook my oatmeal. When I’m on the ball and actually bring my lunch to work I use it to reheat my leftovers. Even in the evening I find myself using it to heat any number of foods, drinks, or dishes. However, I wish that I didn’t rely on it so much. It just doesn’t feel right to be “nuking” so much of the food I eat. I know…I know…it’s silly to have any concern as microwaves have been proven to be completely safe so I really shouldn’t worry about it. Plus, ever since hearing my two-year-old niece say “mic-or-ave” I’ve felt a bit more affectionate towards it. Seriously, I’ve listened to this recording of her dozens of times and still laugh. Every. Single. Time. So when I recently learned that you can actually make crispy potato chips by slicing a raw potato and putting it in the microwave for a few minutes, I figured I’d give it a try. 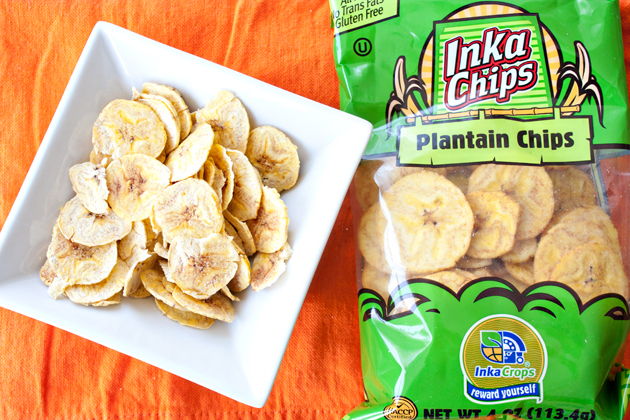 However, I wanted to try it with plantains, which happen to be my biggest chip obsession at the moment. I figured that if it works with potatoes, it’s likely to work similarly with plantains, right? And besides popping plantains in the microwave for 5 minutes can’t possibly be worse for me than the deep fried ones I am buying at the store nearly every day. So, yes, Mr. Mic-or-ave, you win this time in the “lesser of two evils” battle. As you can see, I used my mandoline to get super thin and even slices, which is an important step in the process of making these. 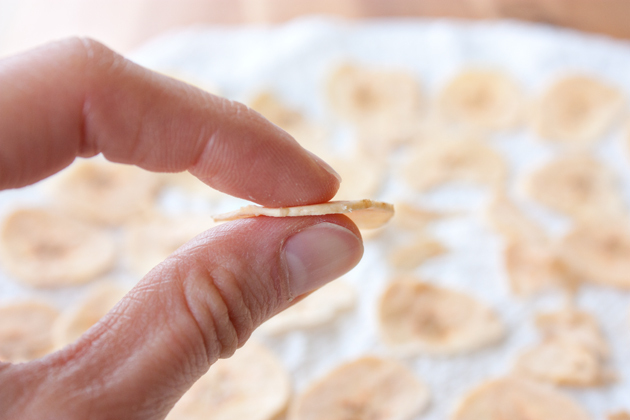 If you don’t have a mandoline, try to cut them as thin and evenly as possible. I brushed each slice with a bit of olive oil and then sprinkled salt on top. You can omit one or both of these steps, but I actually think that the slightly dry plantain does well with a bit of both. Again, I have to remind myself that the bit of oil and salt I put on them is far less than what I’m consuming from the bags I buy at the store. You want to place the slices in a single layer on a paper towel lined plate. Then brush each slice with oil, sprinkle with salt, and place them in the microwave on full power for 3 minutes. As the end of the 3 minutes approaches you’ll start to notice your kitchen smelling like sweet plantains and when the time is up, pull them out of the microwave, turn over each slice, and then place them in for another 3 minutes on half power. 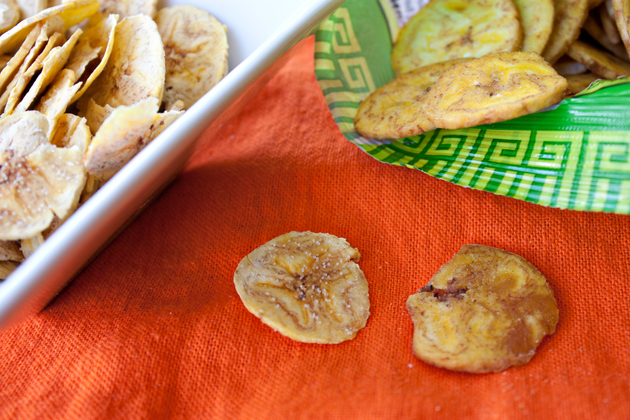 At this point you’ll have deliciously, crispy plantain chips! That’s all there is to it! While I was experimenting with this, I purchased a bag of plantain chips at Whole Foods so that I could eat them all see how the two compare and the best comparison that I can make is that my homemade version are like eating Baked Lays, while the store-bought are like eating regular Lays. The microwaved version tastes decidedly healthier, but they still satisfy the need for a delicious, crunchy snack. The chip I’m holding is my homemade version, which is also the one on the left in the photo below. You can see the comparison to the deep fried version on the right. Not too shabby! 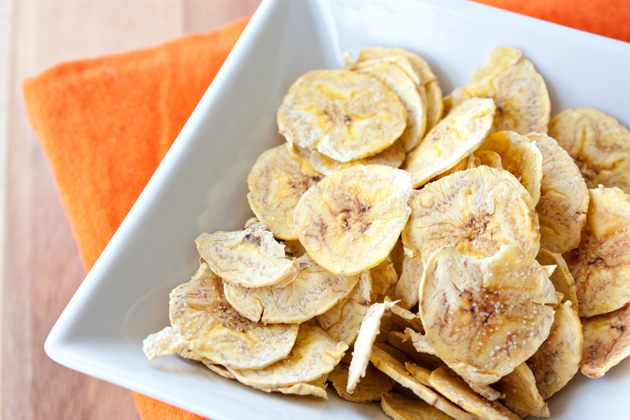 Slice Plantain: Cut open your plantain by running a sharp knife along the long side of it. Try to cut only as deep as the peel. Pull the plantain out of it’s peel and then cut it into very thin and even slices. Microwave: Place them in a single layer on a paper towel-lined plate. Brush with olive oil and sprinkle with salt. Cook in the microwave on high power for 3 minutes. Pull the plate out of the microwave and turn over each slice before putting them back in the microwave for another 3 minutes on half power.